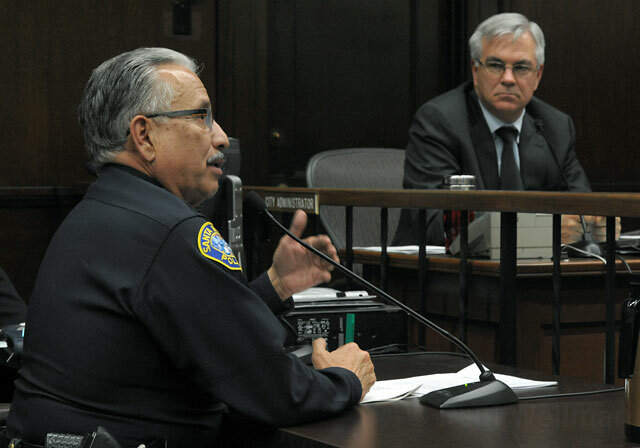 Police Chief Cam Sanchez addresses the council. City Administrator Jim Armstrong looks on. Sanchez said 2,580 people applied for the one entry-level officer vacancy, 472 took the exam, 271 passed the physical agility test, and 260 will be interviewed. He announced that he’s including an item in this year’s budget to purchase in-car cameras; currently, Santa Barbara and Guadalupe are the only two law-enforcement agencies in Santa Barbara County without such equipment. He also announced his intention to begin “minor league” recruiting effort to start grooming Santa Barbara teens for the department to nurture the SBPD’s roots in town. And in an effort to improve community relations on the Eastside, Sanchez said he and many of his officers will cohost a potluck with PUEBLO — an organization that’s been critical of the chief and the department’s car-impoundment practices for unlicensed drivers — on June 7. The chief never addressed a proposal that came to light last week to give the council legal authority to hire and fire the chief; currently, that power rests with the city administrator. Only Councilmember Cathy Murillo acknowledged the matter. If people had issues with the department, she said, they should voice their grievances during the chief’s monthly presentations. “This is the venue,” she said. “right here, right now.” No one from the public, however, showed up to say anything.